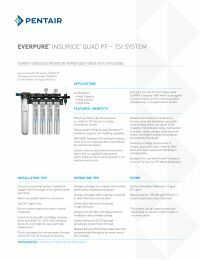 The Everpure EV932477 is a sediment filtration system specifically designed for ice applications. This system begins with a sediment pre-filter designed to reduce dirt and particulates from the water before it reaches the primary filter. The benefit of the pre-filter will help the efficiency of the system as a whole and extend the cycle life of the primary filter. The primary filtration filters of the EV932477 consist of four 7SI catridge that feature superior dirt-holding capacity through its depth filtration and Fibredyne™ media. These filters effectively removes dirt and other sediment as small as 1/2 a micron through mechanical means. 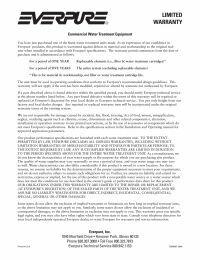 The EV9606-01 filters greatly enhances the capacity of this unit up to 100,000 gallons, and is ideal for commercial services that require high-production of ice. These filters will also reduce ice machine maintenance, service costs, and downtime by removing scale buildup and other damaging contaminants. The filters should be replaced every 6 months for maximum performance.